Posted April 12, 2018, by Mckenna Britton in Student News, What's New?. 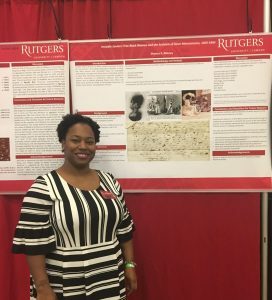 As was mentioned previously, this past Tuesday Rutgers University-Camden hosted the Celebration of Graduate Research and Creative Activities. 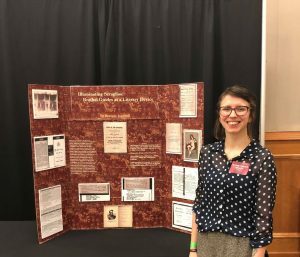 Two of our Graduate History students presented their research at the event – Sharece Blakney and Brittney Ingersoll had a very successful Tuesday afternoon, sharing their research projects with intrigued passersby. Congratulations, once again, Ms. Blakney and Mrs. Ingersoll! We are very proud of you and your work! Images courtesy of Sharece Blakney and Brittney Ingersoll. This page was printed from http://graduatehistoryblog.camden.rutgers.edu/2018/04/12/success-at-the-celebration-of-graduate-research/ at 2:36 PM Friday, April 19, 2019.